Remember that ugly dude you killed at the end of Gears of War? Come December you'll get a chance to see his side of the story. On December 13, Microsoft and Epic Games will release RAAM's Shadow, a new DLC pack for Gears of War 3. Alongside a chocolate-themed weapon skin pack and six new multiplayer characters, the add-on features a 3-hour storyline that takes place before the original Gears of War. "RAAM's Shadow" drops players into the events of Sera post-Emergence Day, as Zeta Squad is enlisted to evacuate Ilima City and protect the citizens against a Locust Kryll storm. Taking on the infamous Locust leader from "Gears 1," General RAAM, Zeta is led by Michael Barrick (from "Gears of War" comics fame) and comprised of familiar faces such as Lt. Minh Young Kim ("Gears 1") and Tai Kaliso ("Gears 2"), and also includes a new female comrade, Alicia Valera. In addition to fighting as a new squad of Gears, players will step into the boots of RAAM himself, and for the first time storm the human stronghold from the perspective of one of the series' most legendary bosses. While this DLC will set you back $15 (read: 1,200 Microsoft points) when it debuts, the press release goes on to urge players (via journalist proxy, I guess) to buy the game's Season Pass, a $30 option that essentially pre-pays for the game's "first four" downloadable add-ons. I won't claim to have the same affection for Gears that many of you do, so I ask you: How exciting is this? 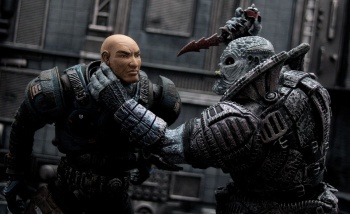 Have you Gears devotees been praying for the chance to play as RAAM ever since that totally unfair fight at the end of the first game? Is this a known life-goal among members of the Gears community? Is Cliff Bleszinski looking down from his balcony at Versailles, urging you all to eat cake and be sated with this gesture lest he be decapitated at the hands of a roaring mob and their wildly unlikely, yet somehow totally apropos chainsaw guillotine?